I've been discussing the decline in power play opportunities and the rise of even strength play on Twitter for a couple years now and wrote a piece about the impact last March, so the main questions I had going into the 2012-13 season was what, if any effect, the lockout and a shortened schedule would have. In a typical year, team discipline starts off poor and power play units have a significant advantage over the penalty kill the first 4-6 weeks of the season. More power plays generating more power play goals. However, with just a 6 day mini-camp and no pre-season games this time, teams had to work out the kinks on the fly, magnifying the strain on defensive systems. The impact of jumping straight into regular season games was significant. 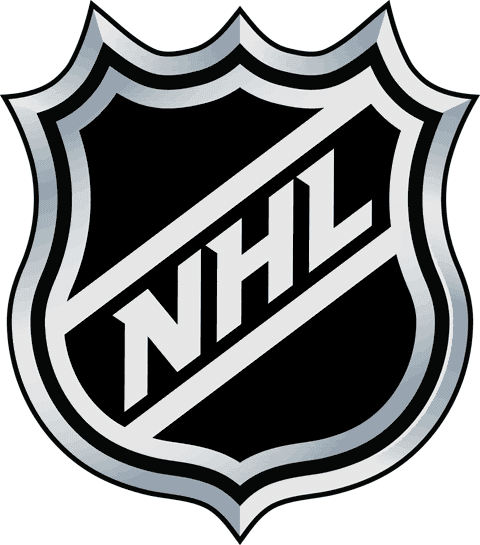 Two weeks into the 2012-13 season and fighting majors were up 25%, minor penalties were up 24% and power plays were generating 27% more towards total offense than where they’d ultimately end the year. Without training camp and pre-season games, it was gong show hockey to start the year with penalty kill units getting hammered with the league average under 80% for weeks. Ultimately, the higher initial spike in power plays and power play goals in a compressed, shortened season would combine to have a masking effect on the end of year averages. 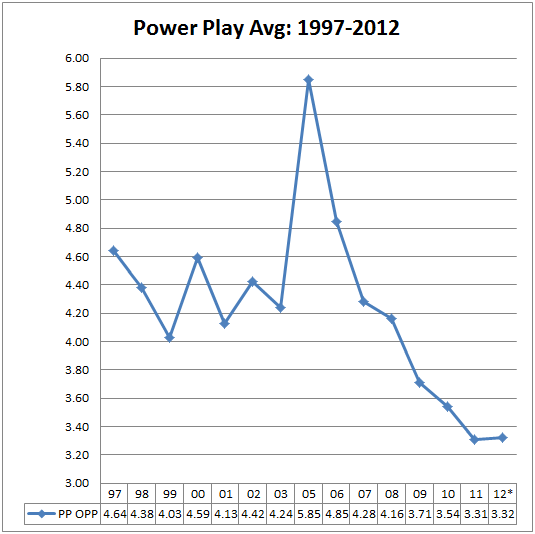 After a 6 year decline in power play opportunities, it would appear they've finally bottomed out with a 0.01 increase over last year but in reality, the season ended too soon to compensate for the higher than normal initial surge in power plays. 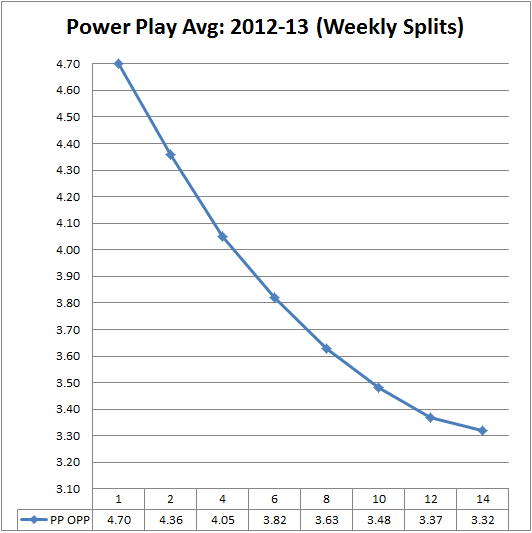 Had the weekly split trend continued through 26 weeks instead of the 14 used to squeeze in 58% of a normal season, the power play opportunity rate would have dropped for a 7th consecutive season, likely close to a game average of just 3.20 power plays per team. So, what does this mean for general managers building for the future and coaches operating in an era where the game is being played at even strength more than at any time in decades? As we saw with the 3.32 power play opportunity average, the breakdown in player points were also skewed by the higher than normal initial surge to start the season and a shortened schedule. 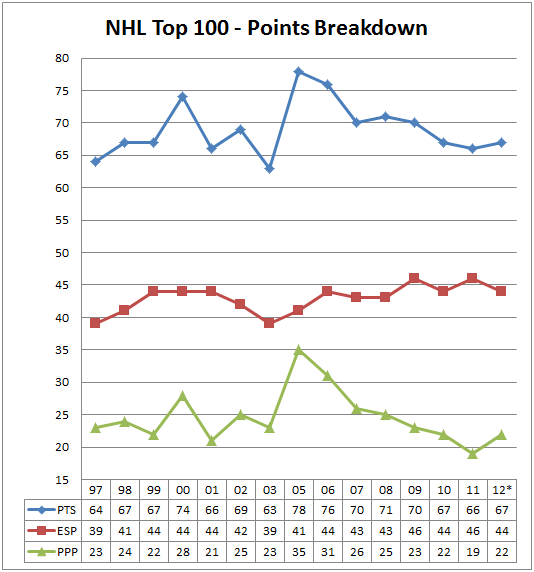 Had there been a standard 82 game season, the top 100 likely would have set another high on even strength points and yet another low on the power play. Looking at the top 100 point producers, which covers the bulk of the NHL’s best offensive forwards and defensemen, it’s clear that power play points continue to be less of a factor. Simply put, with more of the game being played at even strength, there are fewer opportunities to rack up points on the power play. While there must be a bottom somewhere or a trigger for the NHL to revamp the rules yet again to generate more offense, it appears we’re not there yet. For a game that seemed comfortable having teams averaging at least 4 power plays a night for a very long time, I can’t imagine the average dropping below 3. For general managers, the decline in power plays should be having an impact on roster decisions. The Power Play Specialist, code for even strength liability, is starting to become as rare a bird as The Goon, also code for even strength liability. That’s why a bellwether for me on Marc Bergevin’s path forward is the Montreal Canadiens even strength goal differential, which under Michel Therrien, finished the regular season at +.354. To put that number into context, it’s 69% higher than it’s been in 15 years and close to the +.410 average registered by Stanley Cup winners over that time. In other words, Cup contender territory. The Habs have had an unhealthy dependence on special teams and have made roster decisions in the past based more on potential power play contributions, in an era of declining power plays, than what they brought to the table at even strength. With at least 77% of total offense these days coming without a man advantage, it appears the Montreal Canadiens have finally woken up to new realities.